Identity management is the concept of providing a unifying interface to manage all aspects related to individuals and their interactions with the business. It is the process that enables business initiatives by efficiently managing the user life cycle (including identity/resource provisioning for people (users)), and by integrating it into the required business processes. Identity management encompasses all the data and processes related to the representation of an individual involved in electronic transactions. 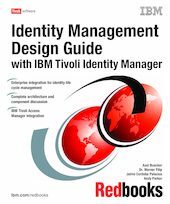 This IBM® Redbooks® publication provides an approach for designing an identity management solution with IBM Tivoli® Identity Manager Version 5.1. Starting from the high-level, organizational viewpoint, we show how to define user registration and maintenance processes using the self-registration and self-care interfaces as well as the delegated administration capabilities. Using the integrated workflow, we automate the submission/approval processes for identity management requests, and with the automated user provisioning, we take workflow output and automatically implement the administrative requests on the environment with no administrative intervention. This book is a valuable resource for security administrators and architects who wish to understand and implement a centralized identity management and security infrastructure. Chapter 7. Tivoli Austin Airlines, Inc.